With Buffer you can schedule and plan your Instagram posts in advance, measure the performance of your content, and collaborate with your team — all in one place. You make Instagram success possible. We make it easy. Buffer is an intuitive platform for scheduling and publishing to Instagram that helps social media marketers and teams work more efficiently and effectively. Schedule single image and video posts on desktop or mobile to any of your Instagram business profiles, and Buffer will publish for you at your preferred times. You’ll need an Instagram business profile for this. Here’s how to switch from a personal to business profile. If you’d like to schedule gallery images, or use Instagram’s native posting features, like filters, we’ll send a notification to your phone at your scheduled time. We’ll automatically load your post into Instagram with your pre-written caption, ready to be pasted, and you can customize and publish. Why can’t I directly schedule this content? Measure the performance of your posts. See how your audience is growing and how your followers are engaging with your content. Available on all paid plans. Work together with your team members to plan and preview your upcoming Instagram posts and campaigns. We’re thrilled to provide an all-in-one Instagram solution that combines automatic posting and notification reminders. Instagram direct scheduling is available to all Buffer customers on all plans. The only requirement is that you have an Instagram business profile. Details on how to convert can be found here. We’re excited for the difference this will make for you! 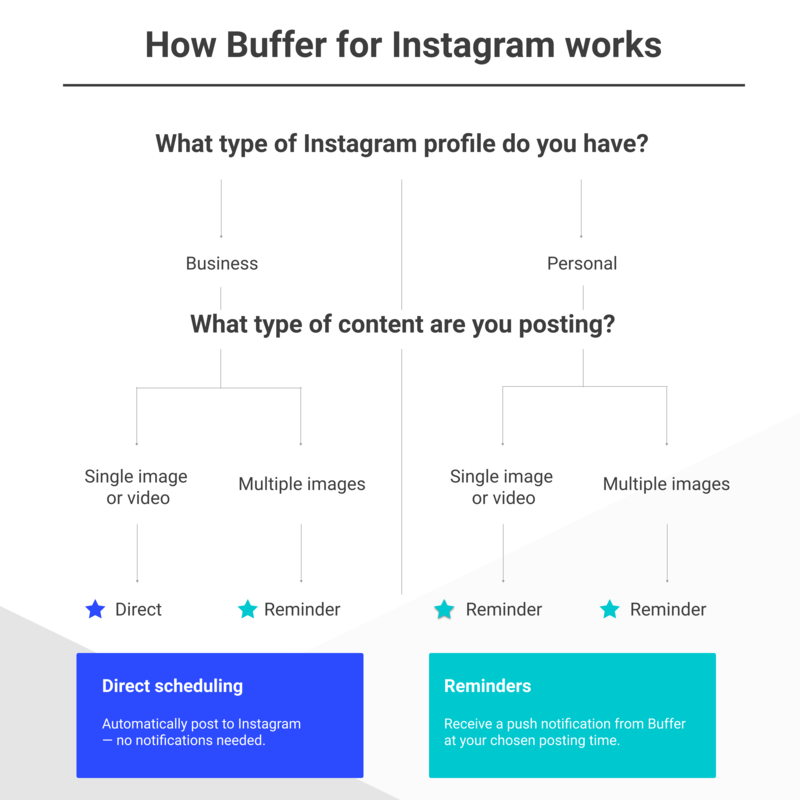 To get the most out of direct scheduling with Buffer for Instagram, here are some guidelines on how direct scheduling works and how to get setup. Which posts can be shared directly? Whenever possible, Buffer will default to scheduling your update to automatically post at your chosen time. For any of your scheduled posts that Buffer can’t share directly, we’ll let you know after you create the post, and will send a notification to you via the Buffer app on your mobile device once the scheduled posting time comes around. In these cases, we’ll help you finish the post in the Instagram app, where you can add things like filters and photo tags. To get fully set up with Instagram direct scheduling and for answers to any questions about the exact flows, we’ve put together a comprehensive resource to guide you through. Is Instagram direct scheduling available for all Buffer users or just for paid plans? Direct scheduling is available to everyone—all Buffer users, all plans, free and paid! What do I need in order to convert my personal Instagram profile to a business profile? You will need to connect your Instagram profile to an existing Facebook business page. If you’ve yet to create a Facebook page for your business, you can do so here. When you’re ready, you can make the conversion via the Instagram mobile app by tapping the gear icon on your profile and choosing “Switch to Business Profile” at the next screen. You do not need a Buffer for Business account in order to connect an Instagram business profile. Instagram business profiles and Instagram personal profiles are free to connect to any of our Buffer plans, free or paid. What aspect ratio do my photos need to have in order to schedule successfully? In order for a post to be directly scheduled to Instagram, the image has to have an aspect ratio within the range of 4:5 (portrait) and 1.91:1 (landscape). Aspect ratio is the ratio of an image’s width to its height. You can calculate the exact ratio for any of your photos by taking the width in pixels and dividing by the height in pixels. You can learn more about aspect ratios in our full FAQ. Will any of my direct-scheduled images be cropped or resized? So long as the image fits within the allowed aspect ratio, it will post full-size and not be cropped. If the image is outside the allowed aspect ratio, your post will be scheduled as a reminder rather than a direct post. You will receive a push notification via the Buffer mobile app at your chosen posting time, and you’ll be able to finish the publish process through the Instagram app. Once I activate Instagram direct scheduling, will all my previously scheduled reminders be converted to direct-scheduled posts? For those folks with previously-connected Instagram profiles and a queue of content, the existing content in the queue will not become a direct post unless the image gets modified. To change an existing reminder to a direct post, you will need to delete the image and then re-upload it again. A note about re-uploading: The image will need to have an aspect ratio within the range of 4:5 (portrait) and 1.91:1 (landscape) to be sent directly. If you do delete and re-upload the photo for a previously scheduled post, the photo needs to be within this aspect ratio range. What happens if I create a gallery post? These posts will automatically revert to an Instagram reminder. You can fully plan this content from your Buffer dashboard (adding a caption with hashtags and @-mentions and setting the time you wish to post), and we will send you a push notification via the Buffer mobile app at your chosen posting time. Will I be able to add photo filters, geotags, or user tags to my image? No, these features are not available with direct scheduling at this time. We understand these elements may be important to you, and we’re working to come up with solutions. For the time being, you may go onto Instagram and make the changes manually after your image has posted. Ready to grow your Instagram audience?